Rare find! 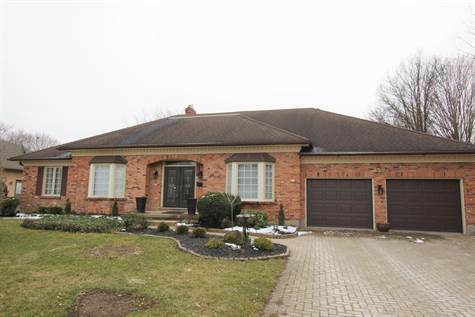 This south facing, sprawling brick ranch home in Lambeth Estates is conveniently located just minutes from the 401, 402 and a short drive to shopping and city amenities. The huge 8 car cement driveway leads to a two-car garage with extra storage space in the depth of one side. The newly renovated home has all hardwood and tile floors throughout the main floor. The huge eat in kitchen boasts granite counter tops, large windows facing private and treed spacious backyard and access to a covered deck convenient for BBQing and relaxing. As the kitchen, dining room and den open to each other, there is ample room for large family gatherings for a sit-down meal. The living room has vaulted ceilings with beautiful dark oak beams and a natural gas fire place. The Master bedroom is spacious with walk-in closet and three-piece ensuite. There is a massive rec room downstairs which could accommodate a pool table, ping pong table, etc. and also a huge family room with another gas fire place. This home could easily accommodate a large extended family or two families as there is a private entrance to basement. Check out room sizes! This home is a must see and won’t last long! Call for your private showing. ▪ Amazing floor plan that flows from elegant foyer to family room to huge beautiful kitchen .Dining room off of kitchen to room with bay window to the front of house .